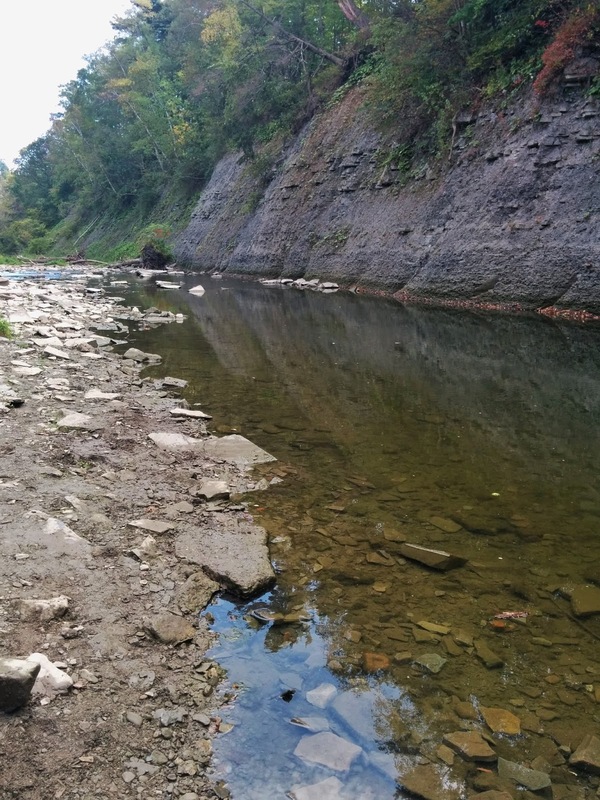 Etobicoke Creek is part of Toronto’s west boundary. Tucked away at the edge of the city, it can be easy to forget or dismiss. I took the effort to get out there in what was an unusually hot September day; it was already above 30 degrees by 11AM. https://platform.twitter.com/widgets.js Getting off the TTC at Sherman Mall, I headed down Sherway Drive, which leads down into the ravine. The road was strange and abandoned, I was fairly surprised this was a link into a trail network, and it was in a bit of a dilapitated state. 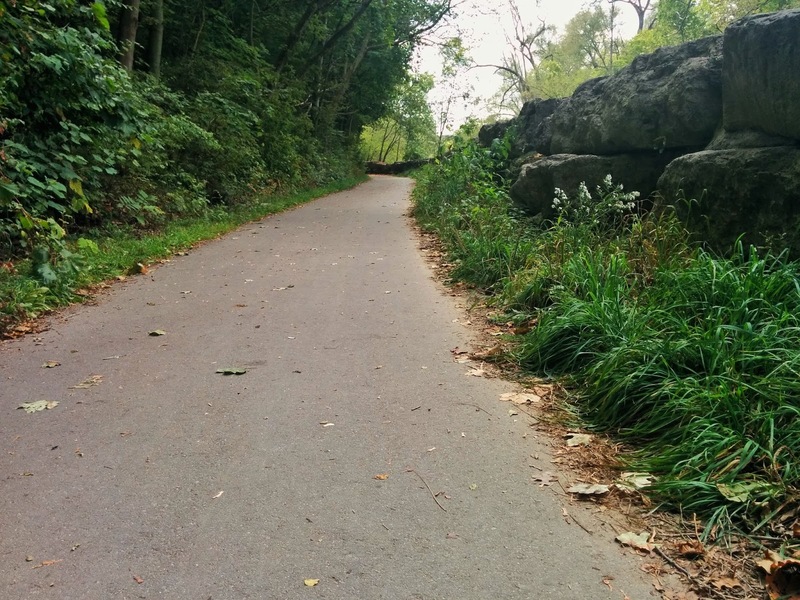 Online documents suggest this part of the trail, the ‘Sherway Link,’ is undergoing improvements soon. 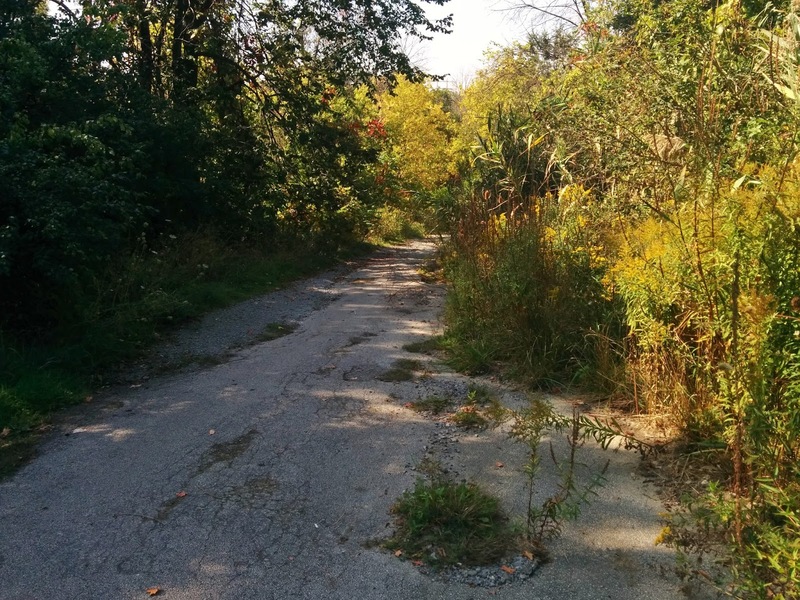 Eventually, the beat-up road gave way to a gravel trail and a field, in view of the QEW / Gardiner / 427 interchange. The city’s maps label this parcel of land (145 Sherway Drive) as general ‘open space’ with no name. To continue south, I had to go under the Queen Elizabeth Way, named not after Elizabeth II, but after the Queen Mother, wife of King George VI. Overpasses are something that have been interesting to me as of late, but I didn’t think the ‘Middle Road’ would be anything special. I clearly wasn’t thinking it through. It was something to behold, with the concrete arches and bleached rocks over and adjacent to calm glassy water. The colour of the graffiti tags and green stains on the concrete added something else to it. If it weren’t for the roar and thudding of highway traffic above, it would be a serene hangout. History time. This was originally built by Ontario’s then-Department of Highways, as ‘The Middle Road’ in the 1930s (the Ministry of Transportation is still the Ministry of Highways in some sense, even 80 years later). Apparently the Minister and Deputy Minister of the day were inspired by German autobahn design, and wanted to bring it to Ontario. They ordered the Middle Road to be designed to these kind of standards, and it opened between Toronto and Burlington in 1937. 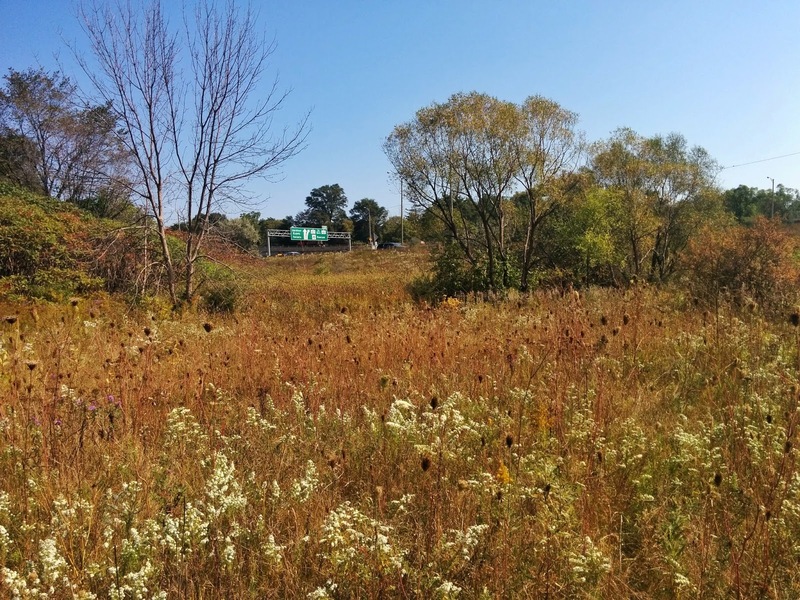 According to Cameron Bevers, who publishes a photographic history of the QEW at thekingshighway.ca, the Etobicoke Creek overpass was built in 1932 to carry a four-lane undivided highway, and it is the oldest structure on the QEW. The structure was widened in 1953 to accommodate two additional traffic lanes along with a centre highway median, and widened again in 1967 for six lanes. The apparent design difference should be noted on either side of this bridge for the ramps to and from the 427. These appear to be more of the style of bents you would find along the Gardiner or DVP, and these were completed in the 60s with the six-lane widening. I encourage you to check out more of Cameron’s website for more cool pictures and information, and hat tip to Twitter user “Not Lost” (@EdgeOfSaturn) for pointing me to this information. 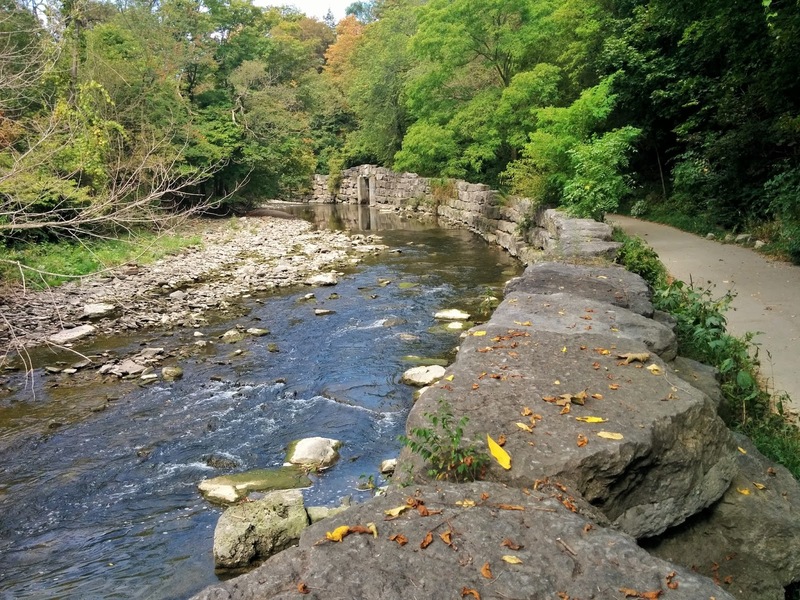 https://platform.twitter.com/widgets.js Continuing south, you enter Etobicoke Valley Park. 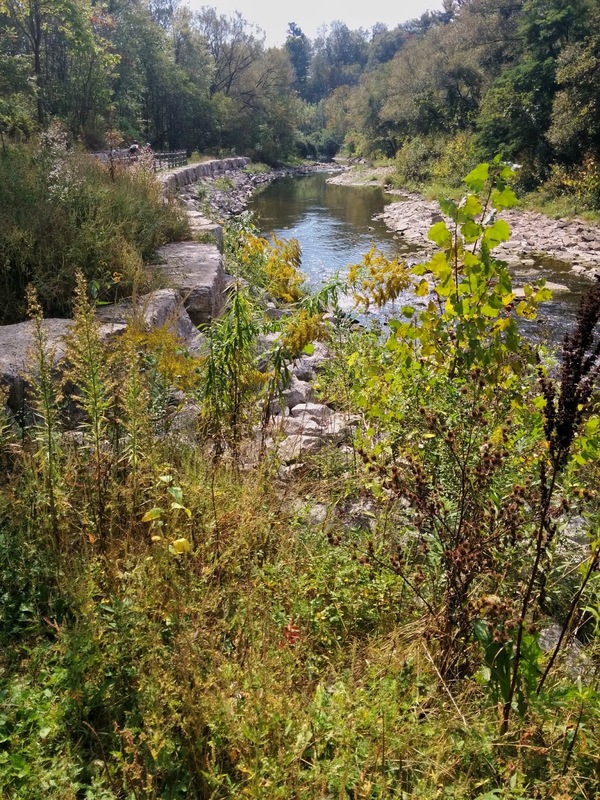 There was some kind of instream infrastructure along the way, and there was a clear beaten path on either side, providing a bit of a risky ad-hoc crossing between Toronto and Mississauga. I also came across this snake. A contact of mine believes it is a northern watersnake. Into the middle of the park, south of Horner Avenue, the trees get thick and you approach the inside of a significant meander in the creek. It’s here that you see some of the watercourses work over thousands of years, as it carved through deposited till and into the shale beneath. I get excited whenever I run into plentiful shale rocks beside water; it’s an excellent opportunity to skip rocks. Further south, I was also quite intrigued by the amount of armourstone laid in the creek valley as an erosion protection measure. It came up to breastbone height in some places, and with the steep valley wall on the other side, it felt like you were walking through some lush jungle gauntlet. https://platform.twitter.com/widgets.js Now digging into Torornto archives for this post, I came upon this very intriguing plan for part of the former Village of Long Branch, which proposed a number of houses up to and over Etobicoke Creek. Whether or not this was completed in full is unclear, but at least some of it was. In 1954, there was reported carnage from Hurricane Hazel causing flooding at the mouth of the creek, including the losss of over 40 homes and 6 deaths. Another 147 cottages at the mouth were declared unfit for habitation after the flooding when sanitation facilities broke down. As with many other areas throughout Toronto and the greater area, dwellings were removed from the floodplain, and the area was turned into parkland. 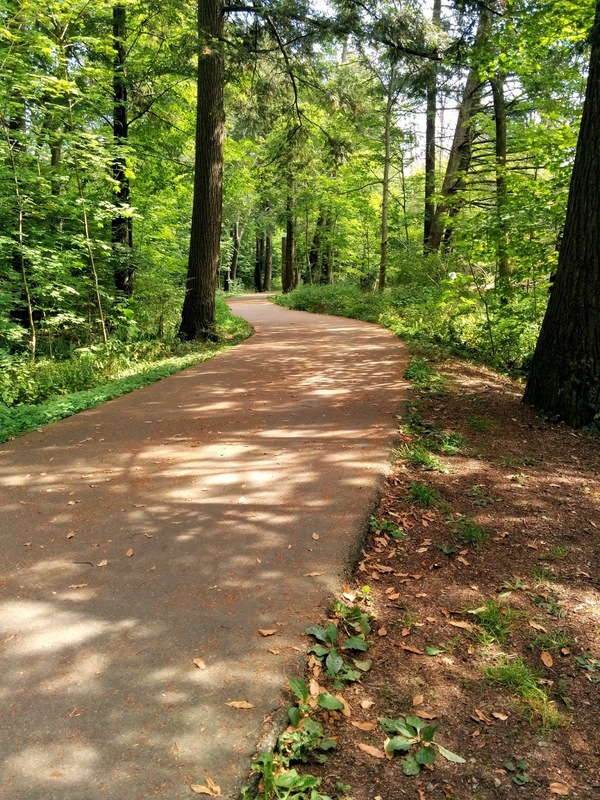 The park was dedicated to longtime village Reeve Marie Curtis in 1959.
https://platform.twitter.com/widgets.js Marie Curtis now has a lovely boardwalk and beach. I knew it was going to be hot, but previous experiences of swimming in Lake Ontario had been frigid. Nonetheless, I brought my swimming shorts with me, and I’m glad I did. The water was perfect. I saw other tweets that day of people complaining that it was too warm; clearly, they have not swam in Lake Erie, like I often did as a teenager growing up in southwestern Ontario. Conquering Lake Ontario was quite the accomplishment in late September, I thought, considering it was generally a colder lake in some spots. It definitely fit with a narrative by Shawn Micallef at that time, that the common thought of summer ending after Labour Day was a myth that needed dispelling, so I had to give him a shout out. https://platform.twitter.com/widgets.js I also saw this tweet a couple days later. No wonder it was warm. https://platform.twitter.com/widgets.js I proceeded along Etobicoke’s lakeshore from here, but that is a whole other can of worms. I’ll save that for a post on another day.